The Tech Works CC-DS is a 4 light Intelligent Annunciator panel available in a variety of color options. 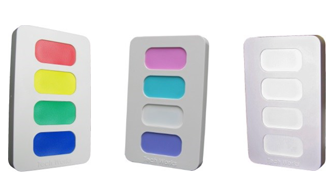 Standard Color Options are “B” for Bright Colors, Red Yellow, Green, and White, or “P” for Pastel Colors Pink, Ice Blue, White, and Purple, or “N” for No Colors (All White). The 4 windows are back lit by white LEDS and can easily be labeled to correspond to staff or locations such as restrooms or functions. The CC-DS is field programmable for a variety of functions and options. The dip switches allow the installer to choose the group of stations or rooms to represent and the tone to sound or not sound with each group of events. An integral tone option is available if ordered with the “T” (Tone) suffix. The Tech Works Intelligent Data Network Communication allows the status of buttons and lights to be sent to Intelligent Master/Annunciator and other Substations.